Warwick Township Historical Society - Times Publishing Newspapers, Inc. The Warwick Township Historical Society is an all-volunteer nonprofit organization dedicated to keeping history alive. You do not have to be a resident of the township to join. They have members throughout the United States. The Society was founded in 1993 for the purpose of saving the John Moland House (ca. 1754). This historic house was abandoned in 1986, quickly deteriorated, and finally was condemned due to neglect. Now, over 30 years later, it stands as a proud monument to our nation’s past and to General Washington and the 11,000 troops who camped here for 13 days in August of 1777. At this house, listed on the National Register of Historic Places, the Marquis de Lafayette and Count Casimir Pulaski joined the American cause. 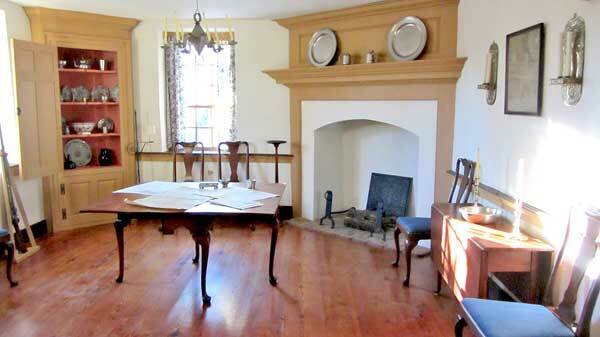 The house is now a museum that features 18th century furnishings (check www.moland.org for tour times). The WTHS was responsible for the fundraising, planning and oversight of the restoration of the Moland House, but their mission today has expanded significantly. They are still responsible for the upkeep and maintenance of the house and the grounds. They pay the bills, make the improvements necessary on the property to keep it safe and attractive, and offer many programs to provide educational and recreational resources for the community. Local teachers now bring hundreds of their students to learn first hand about the American Revolution and colonial life. WTHS has a garden of native Pennsylvania plants that is magnificant from spring through fall. On the 12 acres that surround the house there is a nature trail that winds for a mile through the woods with educational stops along the way. A picnic grove with tables and charcoal grills sits just north of the house and a great place to fish on the banks of the Neshaminy Creek is to the south. The beauty of the site has made it a favored place for family, wedding, and graduation photographs. They feature a Spring Tea, (April 15th), a Christmas Dinner, and a Annual Revolutionary War Reenactment (August 11th) featuring military demonstrations, 18th century entertainment, and colonial crafts. Although they provide great programs and services for the community, if they do not get more volunteers for leadership roles and tasks like gardening, landscaping, and website management to name a few, this beautiful resource could all disappear. Contact them at 215-918-1754 for opportunities to get involved.